Bundesliga | Werder Bremen’s Zlatko Junuzovic: "Nordderby is the game of the season!" Junuzovic will make his 160th Bundesliga appearance for Bremen when they take on Hamburg on Sunday. 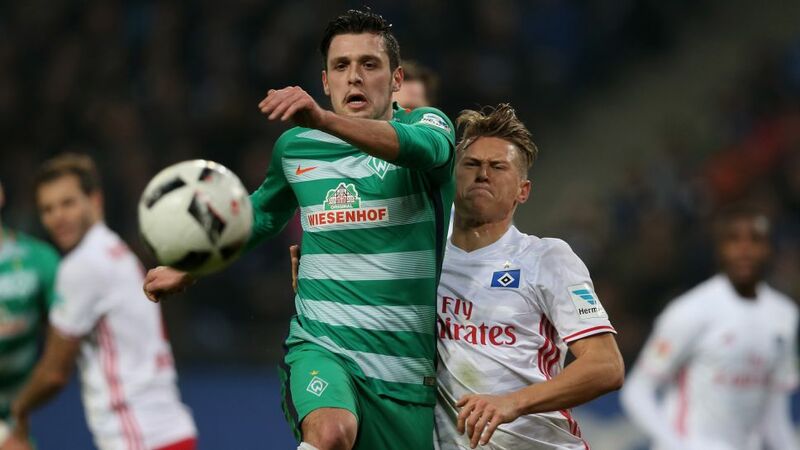 Werder Bremen’s Zlatko Junuzovic: "Nordderby is the game of the season!" Werder Bremen and Hamburg go head to head in the Nordderby on Sunday with both teams enjoying a significant recent upswing in form. The Green-Whites are unbeaten in eight games; in which time they have collected 20 points. bundesliga.com: Zlatko Junuzovic, Werder Bremen and Hamburg will not meet as two teams in the abyss. Both have been pulling away from danger lately. What are your expectations for the Northern Derby? Zlatko Junuzovic: We haven’t yet completely freed ourselves of any relegation worries, of course. We want to reach the 40-point mark as soon as possible to be truly safe. There is huge anticipation for the game. A derby is always something special, no matter what the table looks like. We want to win it because we know the huge emotion behind it and how important it is for our fans. We also know Hamburg are on a great run. It won’t be an easy game. If we have any advantage at all it’s that we’re playing at home. Watch: EA SPORTS predicts the Nordderby! bundesliga.com: Please tell us how on Earth it’s possible that Werder won 16 points from their first 20 games, and then 20 points from eight games?! How did you turn it around? Junuzovic: The reasons are simple, but difficult to implement. The team worked together meticulously and talked a lot. Our team spirit is high. We’re very determined. But this has been the case for some time. We played some good games, some of which we lost. At times like that the mood in the camp is crucial. We never gave up, and the cohesion in our group was fantastic. It would be a mistake to take the remaining games lightly. We have to stay focused. That’s the difficult part. Junuzovic: It’s also about what you are willing to sacrifice. You must also rein in your ego. Players who may have played less over the course of the season are no needed. The best explanation for our recent success is that we’ve used every player when there have been short-term injuries. Everyone matters. This cohesion has led us out of an extremely difficult situation. Watch: Junuzovic scored the goal of the week as Bremen beat Leipzig 3-0 on Matchday 25! bundesliga.com: Werder now have 36 points, meaning you’re seven points clear of the relegation places and just five away from the European places. Is it forbidden at the Weser Stadium to look ahead like this? Junuzovic: We’ve been successful in recent games, but mistakes can happen. We must stay careful. We still have room for improvement. Our effort and performances have been great, but we need to stay realistic. We have also had our share of luck lately. The league is unpredictable. That’s why you can never plan anything. We have to take it one game at a time, as clichéd as that sounds. It’s important to stay focused. This derby is the game of the season. We want to win it. Our ultimate goal is survival, which will be difficult enough. We don’t need to talk about other goals. bundesliga.com: You’ve had some ups and downs. Is Werder’s season symptomatic of your performances? Junuzovic: It's all relative. You have to be realistic and know what your priorities are. My position has also changed. I don’t start quite so offensively any more but I have the liberty to make attacking runs. I’m glad if I can score or assist. I’m quite satisfied with my return [three goals and five assists in 25 games]. I also have defensive duties, which are discussed with the coach and the team. It’s important that I’m physically prepared. I try to do my maximum in every game. I concentrate on that. bundesliga.com: What is your personal balance in this derby? Junuzovic: I don’t know exactly. Off the top of my head I remember the 100th North Derby, in which I scored the goal in our 1-0 win. Head here for the Nordderby match centre!